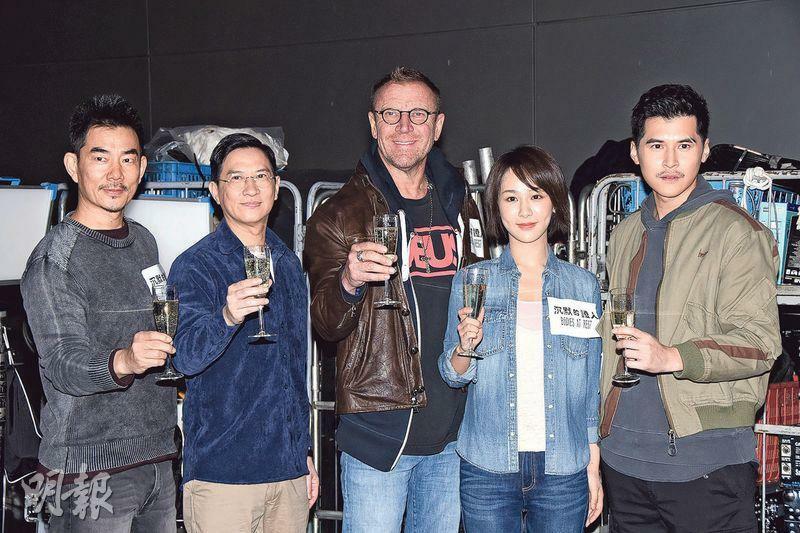 Nick Cheung Ka Fai, Richie Jen (Yam Yin Chai), Carlos Chan Ka Lok, Mainland star Yang Zi and director Renny Harlin two nights ago attended the action film BODIES AT REST (CHUM MUK DIK JING YUN)'s production wrap ceremony at the Kowloon Bay Cruise Terminal as everyone celebrated with champagne. Siu Chai said that the film was very exciting. He had to fight like a thug. Ka Fai even asked for more takes. Ka Fai and Siu Chai played a medical examiner and a robber. Two nights ago Siu Chai attacked the morgue in an attempt to destroy his criminal evidence. Siu Chai said that this film shoot was very exciting. "I had to fight like a thug. Ka Fai had it the toughest as he had to fight three against one. Sometimes he even took one of my punches. He really risked his life. In one scene He had to kick Ka Fai off a platform. The director was OK after several takes, but Ka Fai wasn't pleased. He thought it lacked power and asked for more takes. He took me to toss him off the platform. He was the Best Actor so I felt bad. He probably was in a lot of pain." Ka Fai said that his rear had protective pads and he was safe. Ka Fai also said that Siu Chai took risks as well with the glass shattering scene. Was Siu Chai hurt? He said, "Yes, (any place important?) No." Ka Fai joked, "It's gone?" Siu Chai explained that he was not kicked where it would hurt. They reunited 14 years after BREAKING NEWS (DAI SI GEIN). Siu Chai pointed out that he remembered when Ka Fai personally performed the car crash stunt, he thought it was done by a stuntman. When he got closer he realized it was Ka Fai. Ka Fai admitted that he would not dare to do that at his age. Working together again, Ka Fai said that everyone understood each other more and their communication was more mature. Siu Chai also was very easy going and they could very comfortable work on both dramatic and action scenes. Siu Chai said that Ka Fai taught him how to avoid the glass bottle. As for working with Renny Harlin, Siu Chai said that the director shot with a Hollywood style. The shot break down was very precise and clear. He was also very thoughtful and said that he wanted to show everyone the current Hong Kong, thus he did not understand why Hollywood films that came to shoot on location in Hong Kong had to shoot chicken slaughter at the market. Every time felt very Chinatown. They also said that they felt how serious the director was. Ka Fai also said that under the current film trend it was good to be able to work with many regions. In the future Hong Kong film could work with Iranian, Indian or Japanese directors, as film exchanges would be even better. Shooting for the first time in Hong Kong, Renny Harlin directed DIE HARD II. He said that he really liked Hong Kong and has loved Hong Kong film since he was little. He was very happy to shoot a movie in Hong Kong this time with a good team and good location. It felt wonderful. Why did he choose to work with Ka Fai? He said, "he is the best actor in the entire world. If I have a chance I would like to work with Ka Fai again." Mainland star Yang Zi also came to shoot a movie in Hong Kong for the first time. She admitted that she had language problems because she had to speak English and Cantonese with Mainland and Taiwan team members. The feeling was very wonderful. Playing a medical examiner in training, she said that Ka Fai was her idol and she really liked him. At the start of the shoot she was a little nervous, later she realized that he was as innocent as a child and very passionate with others. He even took the initiative to joke around with her. He was very friendly. Did she have to fight in the film? She said, "It's very funny. The director at first said that I had to fight like superwoman. Then everyday I got a beating. I asked the director if he got the wrong person, did he want Yeung Chi King (Michelle Yeoh?)" Was she injured? She said that the team was great, the actors were very well protected so she was not hurt.